Party in style, retro-style that is! With the 8-Bit Luncheon Napkins, you can have a 1980's flashback with your party tableware. 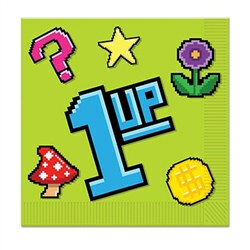 Create a video game theme through these 8-Bit Luncheon Napkins. The 1980's were very retro and technological, so be sure to have party decor that flow with your theme. This theme will be perfect for a class reunion or birthday party! Go all out with the 8-Bit party supplies to show off your favorite decade.